Aphids found in cucurbits include green peach aphid and melon aphid. Melon aphid has a wide host range; vegetable crops attacked include cucurbits, asparagus, pepper, eggplant and okra. Among cucurbits, it is more serious on cucumber, muskmelon and watermelon than in squash and pumpkins. Varieties differ in susceptibility. The cornicles at tip of abdomen are always black, a key diagnostic feature. Melon aphid outbreaks are more common in hot, dry weather. Melon aphid overwinters in the north on woody plants including catalpa and rose of sharon; more southerly, adults survive on cold tolerant plants including spinach and dock. Life cycle is similar to green peach aphid; winged females colonize crops in early summer, and wingless females produce live young for about 15 days (70-80 offspring per female) resulting in multiple generations. The time from birth to reproductive adult can be one week. Wingless females are 1-2 mm long. Color varies from light green mottled with dark green (most common) to white, yellowish or dark green. 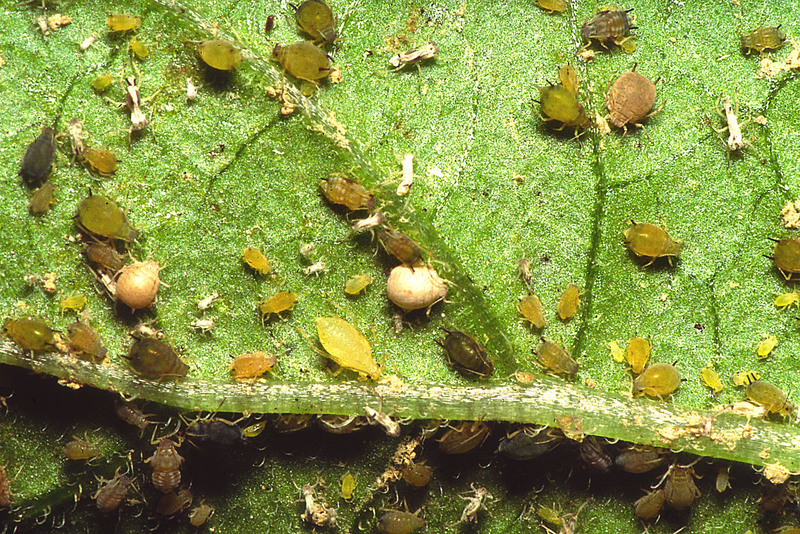 Infestations occur on undersides of leaves where aphids extract plant sap with their piecing sucking mouthparts. Feeding causes yellowing, puckering, leaf curling, and leaf death at high numbers along with shiny honeydew deposits and buildup of sooty mold. Viruses transmitted by melon aphid include cucumber mosaic, watermelon mosaic, and zucchini yellow mosaic. Because transmission occurs within 15 seconds of feeding, insecticides may not prevent initial virus infection though they may reduce its spread in the crop. Oils may reduce virus transmission but test for phytotoxicity. Scout for aphids beginning in mid June by searching undersides of leaves on runners. If 20 percent of runners or more have live aphids treatment may be needed. Good coverage of undersides of leaves is needed for control. Cultivars differ in susceptibility to aphid buildup and to virus; plant resistant varieties if they are available. Use row covers or reflective plastic mulch to prevent early infestation and virus transmission (direct seeding is recommend in reflective mulch for maximum effectiveness). Separate early and late plantings. Use selective insecticides for other pests to conserve natural enemies.